I have an app where the UITableView's separator inset is set to custom values - Right 0, Left 0. This works perfectly in iOS 7.x, however in iOS 8.0 I see that the separator inset is set to the default of 15 on the right. Even though in the xib files it set to 0, it still shows up incorrectly. How do I remove the UITableViewCell separator margins? iOS 8.0 introduces the layoutMargins property on cells AND table views. This property isn't available on iOS 7.0 so you need to make sure you check before assigning it! Additionally, Apple has added a property to your cell that will prevent it from inheriting your Table View's margin settings. When this property is set, your cells are allowed to configure their own margins independently of the table view. Think of it as an override. This property is called preservesSuperviewLayoutMargins, and setting it to NO will allow the cell's layoutMargin setting to override whatever layoutMargin is set on your TableView. It both saves time (you don't have to modify the Table View's settings), and is more concise. Please refer to Mike Abdullah's answer for a detailed explanation. NOTE: what follows is a clean implementation for a cell-level margin setting, as expressed in Mike Abdullah's answer. 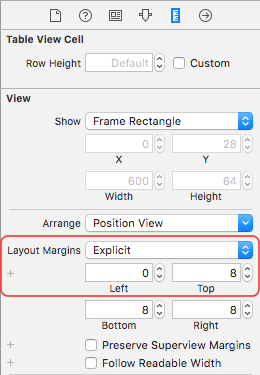 Setting your cell's preservesSuperviewLayoutMargins=NO will ensure that your Table View does not override the cell settings. If you actually want your entire table view to have consistent margins, please adjust your code accordingly. Setting the preservesSuperviewLayoutMargins property on your cell to NO should prevent your table view from overriding your cell margins. In some cases, it seems to not function properly. ...and there you go! This should work on iOS 7 and 8. EDIT: Mohamed Saleh brought to my attention a possible change in iOS 9. You may need to set the Table View's cellLayoutMarginsFollowReadableWidth to NO if you want to customize insets or margins. Your mileage may vary, this is not documented very well. This property only exists in iOS 9 so be sure to check before setting. or setting the cell.layoutMargins = UIEdgeInsetsZero; fixed it for me. Let's take a moment to understand the problem before blindly charging in to attempt to fix it. A quick poke around in the debugger will tell you that separator lines are subviews of UITableViewCell. It seems that the cell itself takes a fair amount of responsibility for the layout of these lines. iOS 8 introduces the concept of layout margins. By default, a view's layout margins are 8pt on all sides, and they're inherited from ancestor views. As best we can tell, when laying out out its separator line, UITableViewCell chooses to respect the left-hand layout margin, using it to constrain the left inset. This code only needs to be run once per cell (you're just configuring the cell's properties after all), and there's nothing special about when you choose to execute it. Do what seems cleanest to you. Sadly neither property is available to configure in Interface Builder, but you can specify a user-defined runtime attribute for preservesSuperviewLayoutMargins if desired. Clearly, if your app targets earlier OS releases too, you'll need to avoid executing the above code until running on iOS 8 and above. Rather than setting preservesSuperviewLayoutMargins, you can configure ancestor views (such as the table) to have 0 left margin too, but this seems inherently more error-prone as you don't control that entire hierarchy. It would probably be slightly cleaner to set only the left margin to 0 and leave the others be. In iOS 8, there is one new property for all the objects inherit from UIView. So, the solution to set the SeparatorInset in iOS 7.x will not be able to remove the white space you see on the UITableView in iOS 8. The new property is called "layoutMargins". Description   The default spacing to use when laying out content in the view. If you set cell.layoutMargins = UIEdgeInsetsZero; without checking if the layoutMargins exists, the app will crash on iOS 7.x. So, the best way would be checking if the layoutMargins exists first before setLayoutMargins:UIEdgeInsetsZero. This way, you keep your UIViewController's code clean and can always override it if you want. iOS introduces the layoutMargins property on cells AND table views. This property isn't available in iOS 7.0 so you need to make sure you check before assigning it! However, Apple has added a property called preservesSuperviewLayoutMargins to your cell that will prevent it from inheriting your Table View's margin settings. This way, your cells can configure their own margins independently of the table view. Think of it as an override. This property is called preservesSuperviewLayoutMargins, and setting it to NO can allow you to override your Table View's layoutMargin settings with your own cell's layoutMargin setting. It both saves time (you don't have to modify the Table View's settings), and is more concise. Please refer to Mike Abdullah's answer for a detailed explanation. NOTE: this is the proper, less messy implementation, as expressed in Mike Abdullah's answer; setting your cell's preservesSuperviewLayoutMargins=NO will ensure that your Table View does not override the cell settings. Tells the delegate that the table view is about to draw a cell for a particular row. Setting the preservesSuperviewLayoutMargins property on your cell to NO should prevent your table view from overriding your cell margins. In some cases, it seems not to function properly. ...and there you go! This should work on iOS 8 as well as iOS 7. Note: tested using iOS 8.1 and 7.1, in my case I only needed to use the first step of this explanation. The Second Step is only required if you have unpopulated cell beneath the rendered cells, ie. if the table is larger than the number of rows in the table model. Not doing the second step would result in different separator offsets. In Swift it's slightly more annoying because layoutMargins is a property, so you have to override the getter and setter. This will effectively make layoutMargins readonly, which in my case is fine. For more details please refer to question. I just wanted to share an extension I made to remove the margins from the tableview cell separators. As to what cdstamper suggested instead of the table view, adding below lines in the cell's layoutSubview method works for me. 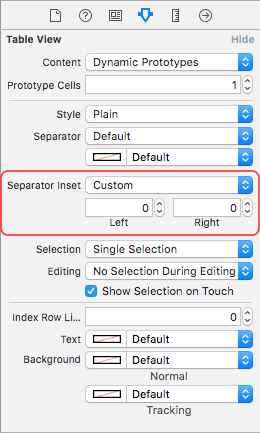 To fully control both separator insets and layout margins on each cell. Do this in the willDisplayCell method on your UITableviewDelegate. In this way you are setting layoutMargin and separatorInset just one time instead of doing it for each willDisplayCell as most of the above answers suggest. If you are using a custom UITableViewCell this is the correct place to do it. Otherwise you should do it in tableView:cellForRowAtIndexPath. Just another hint: you don't need to set preservesSuperviewLayoutMargins = false because default value is already NO! Just add below code can solve this program. This seems the cleanest to me (for now), as all the cell/tableView edge/margin adjustments are done in the tableView:willDisplayCell:forRowAtIndexPath: method, without cramming unneccessary code into tableView:cellForRowAtIndexPath:. Btw, I'm only setting the cell's left separatorInset/layoutMargins, because in this case I don't want to screw up my constraints that I have set up in my cell. Most answers are showing separator insets and layout margins being set over a variety of methods (i.e., viewDidLayoutSubviews, willDisplayCell, etc) for cells and tableviews, but I've found that just putting these in cellForRowAtIndexPath works great. Seems like the cleanest way. Use below code snippet avoid unwanted padding issue for UITableView in IOS 8 & 7. Here's an easy way to globally remove the inset. You might think to a) also just override separatorInset in the extension, or b) set the appearance proxy for layoutMargins, instead. Neither will work. Even though separatorInset is indicated to be a property, attempting to override it as a property (or method) generates compiler errors. And setting the appearance proxy for UITableViewCell's layoutMargins (or, for that matter, also setting the appearance proxies for UITableView's layoutMargins and separatorInset) has no effect. For any specific cell you want to hide the separator. we can consider that setting the cell's separator to zero has to move the separator in two steps: first step is to set cell's separatorinset to zero. second step is to set cell's marginlayout to zero. set the TableView's separatorinset and marginlayout can affect the Cell's separatorinset. However, from the test, I find that the TableView's separatorinset seem to be useless, TableView's marginlayout can actually affect cell's marginlayout. set Cell's PreservesSuperviewLayoutMargins = false, can cut off TableView's marginlayout effect on Cells. This is my solution. This applies to the custom cell subclass, just add them both to the subclass. This worked perfectly for me in iOS 8 and iOS 9. Not the answer you're looking for? Browse other questions tagged ios objective-c swift uitableview ios8 or ask your own question. How to fix UITableView separator on iOS 7? How to make table cells and separator full width in iOS 8 with Xamarin? UITableViewCell separator insets 0 not exactly to left border?